A$AP Rocky doesn’t appear to be slowing down. The head of the New York-based A$AP collective has returned with a new visual for his song, “Gunz N Butter” featuring Juicy J from his recently released album, TESTING. 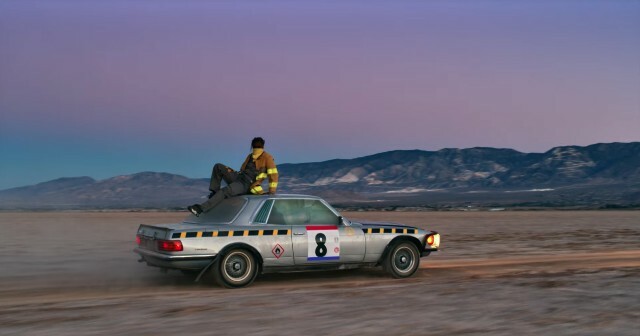 This video comes off the heels of his newest video and song released last week titled, “Sundress.” His most recent visual offering for “Gunz N Butter” is an anxiety driven rollercoaster that follows Rocky first on top of a speeding Mercedes that is racing through the desert. The video takes a stark change when it runs through various scenes of unsettling images such as children holding firearms, a Ku Klux Klan meeting, the 3D printing of weapons, and preteens dressed as crash test dummies. Naturally, this video gives us a small look inside of Rocky’s mind in terms of his thoughts on the current climate of the country. Check out A$AP Rocky’s new video for “Gunz N Butter” below and tell us what you think of the new visual in the comment section below!